Children were everywhere. They were standing on rooftops, shooting marbles in the streets, playing “football” wherever there was bare ground, making their way to and from school. And always in the background there was machine-gun fire. This was a “quiet” time in Rafah. There were no tanks in the streets, no missile-firing helicopters overhead, no Israeli soldiers to be seen. But day and night, there was firing from Israeli towers on the edges of town. I visited Rafah from Jan. 31 to Feb. 5 with my daughter Karen, a recent UW-Madison graduate. We hoped to help dedicate a new playground built in part with funds from Madison residents and support from the Madison-Rafah Sister City Project, a group whose appeal for official city recognition was rejected by Madison’s mayor and Common Council last year. Rafah is a Palestinian city and refugee camp of about 145,000 people in the southern Gaza Strip on the border with Egypt. More than 80% of its residents are refugees. Many have lost their homes two or more times and lived under the constant threat of losing them again as the Israeli Army razed row after row of homes along the Egyptian border. The “camp” areas of Rafah where we spent most of our time are concrete jungles. The homes that remain nearest the border are pockmarked with bullet holes. Tanks, bulldozers and missiles have severely damaged many buildings. Yet people continued to live in them. If they left, the homes were deemed “abandoned” and destroyed, and there was no place to go. Amid this rubble, children continue to play, go to school and live their lives. Last spring, Playgrounds for Palestine donated a playground to be built in the Tel al-Sultan neighborhood of Rafah. One of the poles for the playground was missing from the original shipment, so the playground was stored in a neighborhood home. Then, in May, the Israeli army launched “Operation Rainbow,” a code name for one of the most devastating incursions ever into Rafah. The Tel al-Sultan neighborhood was hit particularly hard, despite its lack of strategic significance. Ten homes were destroyed, and another 156 were damaged. Roads, water and sewage pipes were ripped up. Twenty-six Palestinian civilians were killed, including nine children. The site of the planned playground was completely razed. Loss of the park was hardly the worst disaster that befell the children of Tel-al-Sultan. But the park represented a hope for a more normal life. So last summer, the Madison-Rafah Sister City project set out to raise the $10,000 needed to rebuild this park as a gift from Madison to the children of Rafah. America-Near East Refugee Aid, a nongovernmental organization (NGO), advanced the money so work on the park could begin over the winter. By January, construction of the playground had begun. The missing pole had been shipped and was waiting to cross into the Gaza Strip from Israel. Karen and I went to Rafah to document the playground installation. When we arrived, children were playing soccer in the park, though it was not much more than a field of sand. The first pole of the playground was in place, and many children were checking out the playground construction team and their equipment. Later that day, we were exposed to the precariousness of life for the children of Rafah. Two schoolgirls standing in their school courtyard were hit by machine-gun fire, apparently from a nearby Israeli surveillance tower. One of them, 11-year-old Noran Deeb, was shot through the head and died instantly. The other, 7-year-old Aysha Al Khatib, was shot through the hand. We saw Aysha at the hospital, then stopped briefly at the morgue to see Noran’s body. (The Israelis denied involvement, saying the bullets were from a Palestinian celebrating by firing his gun in the air, although the trajectory of the wounds did not support this.) School officials told us this was not the first time fire from the sniper tower was directed at the school, but it was the first to cause injuries and death. Later, classes were dismissed and children surrounded us, asking us questions, laughing and posing for photographs. Throughout the week we talked with city officials, health-care workers and members of nongovernmental organizations. We learned more about homelessness, malnutrition and stress disorders among Rafah’s children. At night, we were told, there is an epidemic of nightmares and bedwetting. Every day, we visited the playground and were surrounded by active, seemingly happy children. We visited Aysha in the hospital. Her father told us that her hand was healing well. Aysha sat up and smiled shyly for a picture. When we left Rafah, the missing pole was still being held at the crossing into Gaza. But children were playing on the partially completed playground. And, as always, there was machine-gun fire from the direction of the Israeli towers. Both the fund-raising and the installation have since been completed. The missing pole was finally allowed into Gaza during the last week of March. The Madison-Rafah Sister City Project is now working with Family Farm Defenders in Wisconsin and the Women’s Empowerment Project in Rafah to send powdered milk from Wisconsin’s dairies to Rafah. Noran Deeb was the 99th child in Rafah to die from Israeli violence since September 2000, when the Second Intifada began. The toll reached 103 on April 9, when three 14-year-old boys from the Tel al-Sultan neighborhood were shot. I am left wondering if these boys were among the children I met in the park that Madison helped rebuild. KATHY WALSH, AN EMT, IS A MEMBER OF THE MADISON-RAFAH SISTER CITY PROJECT, MADISONRAFAH.ORG. Since September 2000, a total of 118 Israeli children and 678 Palestinian children have died as innocent victims of the violence in the Middle East. For information on these children, visit “Remember These Children” at www.remeberthesechilden.org. For information on “Operation Rainbow,” visit the Human Rights Watch Web site at hrw.org/reports/2004/rafah1004. 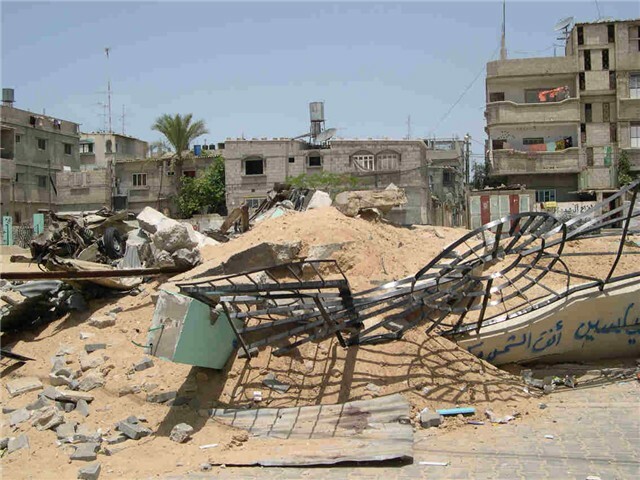 This entry was posted in MRSCP and tagged Delegation, Health, Images, Rafah, Violence by admin. Bookmark the permalink.